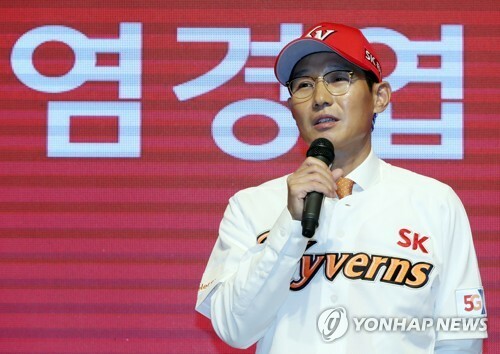 INCHEON, Nov. 15 (Yonhap) — The new manager of the reigning South Korean baseball champions SK Wyverns said Thursday that he is looking to play entertaining baseball that satisfies fans. Yeom Kyung-yup was formally introduced as the new manager for the 2018 Korea Baseball Organization (KBO) title holder and replaced outgoing skipper Trey Hillman. Yeom signed a three-year contract worth 700 million won (US$615,000) per year with the Wyverns on Tuesday. He was the Wyverns’ general manager before moving to a coaching job. Yeom previously managed another KBO club, the Nexen Heroes, from 2013 to 2016 and went to the postseason in all four seasons. He compiled a 305-253-6 (wins-losses-ties) record with the Heroes, who lost to the Samsung Lions in the 2014 Korean Series. The 50-year-old abruptly resigned from the Heroes job moments after being eliminated by the LG Twins in the first round of the playoffs in 2016. Then in January 2017, Yeom became the Wyverns’ general manager. The Wyverns advanced to this year’s South Korean baseball championship series after taking the best-of-five KBO playoff series in five games. Yeom said he believes the Wyverns and the Heroes can keep playing exciting games when they square off. Game 5 of the playoff series ended in an 11-10 win for the Wyverns in extra innings. Yeom said there is some pressure in taking over a team that has just won the KBO title, but he is ready to overcome the difficulties. Yeom said he will keep developing the style of baseball that Hillman played with the Incheon-based club. The new manager said he’ll especially focus on improving the team’s ability in defensive shifts, bullpen operations regarding setup men and executing plays in detail.